Results for the June 23 Jockeys and Jeans Fundraiser at Canterbury Park are in and the group of former jockeys raised $310,000, easily topping the record $254,000 raised at Parx Racing last year. The total puts the amount raised by the group to well over $1 million. An all-volunteer group, Jockeys and Jeans came together for a jockey reunion at Tampa Bay Downs in early 2014 and decided to make it into a fundraiser and donate all proceeds to the Permanently Disabled Jockeys Fund. President Barry Pearl said this year's sold out event is likely the richest single fundraiser in the history of Thoroughbred racing. The track solicited event sponsors and held a poker and golf tournament in which Hall of Fame riders participated. 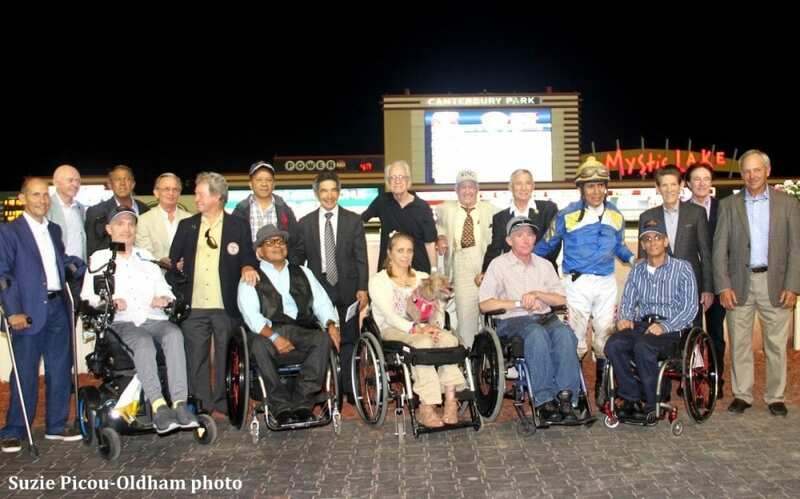 Thirteen attended to honor six permanently disabled jockeys. Edgar Prado flew from his Maryland base to compete with other successful riders and six of the track's past leading riders in the first All-Star Jockey Challenge. Prado, who leads the eight active Hall of Fame riders in victories with over 7,000, got up in the final stride to win aboard Superstar Bea. Barry Butzow, the horse's co-owner, donated his share of the purse, bringing the total raised in the race to $19,000. This entry was posted in The Biz and tagged barry pearl, canterbury park, eddie donnally, edgar prado, Jockeys and Jeans, nancy lasala, pdjf, permanently disabled jockeys fund, Randy Sampson by Press Release. Bookmark the permalink.